Chronicling The Death Of American Newspapers These are dark times for the venerable tradition of newspapers, and most dailies are suffering. There's still a future for noteworthy journalism, though ultimately it may only be available online. 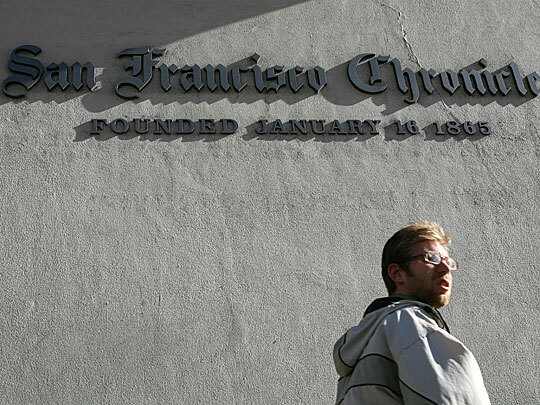 A pedestrian walks by the San Francisco Chronicle building. After posting losses of more than $50 million in 2008, parent company Hearst Corp. announced that unless it can negotiate cutbacks with unions, it may sell or close the 144-year-old newspaper. In a way, Jim Romenesko has become a newspaper obituary writer — except he doesn't write obituaries of people, he chronicles the demise of American newspapers. It's Romenesko's job to cull through the news of the media industry and post stories of interest. Because of the acceleration of dead and dying dailies in the country, Romenesko's blog has turned into a scrolling roll call of bad news. He links to story after story describing the shifting journalistic landscape. For many readers who love newspapers, it's a sad state of affairs. If you clicked on Romenesko — as the blog is popularly known — over the past few days, here is essentially what you saw: "Washington Post profit falls 77% in fourth quarter," "Will Rupert Murdoch end up owning the New York Times and Los Angeles Times?" "Hearst says it will sell or close the San Francisco Chronicle if cuts aren't made in a hurry," "Philadelphia Inquirer and Daily News owner files for bankruptcy protection." And that's only a few of the entries. Sprinkled among the list of sick-and-shut-in big-city newspapers were notices of others that are ailing and failing, such as the 150-year-old Rocky Mountain News, which published its last issue Friday. And an announcement that the American Society of Newspaper Editors has canceled its 2009 convention in April because of stress within the industry. And a slew of raging debates about whether newspapers can be saved, where news will come from in the future and how it will be delivered. And also occasionally in the mix, suggestions for solutions and even, every great once in a while, some hope that readers will still be able to find solid journalism — though it may only be available online. In shorthand, the major problem: Swiftly moving competition from emerging Web sites has hastened the downfall of newspapers. As more people turn to the Internet for news — even, ironically, to the newspapers' own Web sites — fewer subscribe to news printed on paper. As circulation dwindles, so does advertising revenue. And without the same amount of advertising revenue, newspapers can no longer afford large, comprehensive, news-gathering operations. So the newspaper shrinks, attracting fewer readers, leading to a decline in advertising revenue, and the death spiral continues. Newspapers have tried, with varying degrees of success, to migrate to the Web and hold on to their readers. But the advertising revenue is dramatically less than it was for the print version. (Many advertisers have their own economic problems to solve.) Consequently, newsrooms are having to contract — through buyouts, layoffs, combining or closing certain sections and even shutting down the presses altogether. There seems to be a general consensus that the kind of print and photographic journalism supported by large newsrooms and substantial resources is teetering on extinction. Many experts weigh in with possible answers. They are convinced that the First Amendment, government accountability and other lofty ideals hang in the balance. Among the suggestions to save the newsroom: the establishment of collegelike endowments; micropayments (10 cents for every article you read, for instance) or a finely honed hybrid of advertising, donations and user payments. The cumulative effect of the bleak stories amassed on Romenesko's site — amid the reality of massive buyouts and layoffs — has led to deep soul-searching in the journalistic world. The sea change is in-your-face obvious. Some media watchers harbor hope for the fate of newsgathering organizations. But for others, it's easy to feel that the Dark Ages are approaching. Rick Edmonds, media business analyst at the Poynter Institute, spends his days contemplating the future of news gathering and reporting. He says the worst-case scenario looks like this: "This year, 2009, is worse than 2008. We have fresh financial shocks and failures in many aspects of the business. The damage to the advertising base gets worse and worse. Many metro newspapers stop being profitable and go out of business." The result is a conglomeration of blogs, some driven by altruism, some by greed. And a range of nonpaper sites that give you the news. "What you end up with is not as good as a newspaper," Edmonds says. "It lacks common strands." Eventually, if newspapers with national followings — and their Web sites — also go out of business, Edmonds says, "You'll get your political news from Politico, world news from the BBC, entertainment news from Entertainment Weekly and your sports news from ESPN." He says, "We are already beginning to see the outline of something like that scenario." To counter his worst-case scenario, Edmonds says there is a best-case scenario. Here it is: "Newspapers are able to get through this difficult time with a little more, but not much more damage, to their newsrooms," he says. "The recession begins to make a turn later this year. The stimulus kicks in. Newspapers are successful at bolstering print. They find new advertising streams. They send digital editions to Kindle. And mobile devices." And some kind of mutated news-gathering organizations — print and online and other things — emerge from the swamp. But newspaper journalism, he says, "will never be as big again as it was in the golden years of the '80s and '90s." Romenesko has witnessed the implosion of the American newsroom firsthand. "When I started in the business at The Milwaukee Journal" in 1977, he says, "the newsroom was packed with reporters keeping very close watch on every institution in town. They had two reporters covering city hall, three reporters covering the police building, and even a reporter covering the local ballet on a full-time basis. No more." Though Romenesko's blog is nurtured by the Poynter Institute in St. Petersburg, Fla., the man himself lives in the Chicago suburbs. A peripatetic worker, he is a newsroom on wheels — roving each weekday from coffee shop to library to any place with Wi-Fi access. He sits with a laptop, reading media stories and sorting through the various e-mails and leaked memos that Romenesko followers send him. He is exactly the kind of agile, new-breed, Internet-dependent journalist he sometimes features on his site. "By day's end," he says, "I've probably parked myself at five or six different places. I'm online by 6:15 a.m. and wrap things up by 5 p.m."
For cosmic relief Romenesko also runs a nonjournalistic site called StarbucksGossip.com, but most of his working hours are spent aggregating stories about the news business. One noteworthy aspect of the death-of-newspapers story is its effect on aggregator sites, such as the Drudge Report and Romenesko's own. If mainstream print media and their Web sites fade away, serious news aggregators may have to work and search and cull and delve harder to provide a variety of reliable news to readers. "There will always be journalism," Romenesko says. "So I think my job is safe. I'll just have to shift the site's focus." Drew Curtis is founder and chief curator of snarky Fark.com, a rolling roster of quirky stories — news, entertainment, bizzareties. Curtis agrees with Romenesko. "I don't think media consolidation does us any favors" and is quite possibly "harmful to society as a whole," he says. But from an aggregator standpoint, Curtis says, "the vast majority of Fark links come from two places: wire services and small local papers. The decline seems to be hitting midmarket areas the hardest." And, he says, "We don't tend to use them much for anything." What Leonard Downie fears is the death not of the newspaper but of the newsroom. The former executive editor of The Washington Post, Downie recently told the Annenberg School for Communication, "I'm not concerned about the fate of the printed newspaper. I'm concerned about the fate of newspaper newsrooms. Because those are the newsrooms that are doing the reporting that no one else is doing." He said, "So many people who are either afraid about the future of newspapers or are gleeful about the future of newspapers are missing the point. It's not the way in which it's presented; it's the news itself that matters." And the jury is still out on whether enterprising and conscientious journalists will be able to gather and report news — hard-hitting and essential news — using the ever expanding palette of new technologies. Meanwhile, Romenesko says the onslaught of bad news gets to him sometime, yet he remains somewhat hopeful. "On some days," Romenesko says, "I'm overwhelmed by memos about layoffs, buyouts, etc., and I suspect that will continue for some time." But it's interesting, he says, "to document the transition to online. I'll be of retirement age — 62 — in about six years, and I'm not sure what the media landscape will look like then. I suspect few papers will have print editions seven days a week, and many will follow the Christian Science Monitor and be online only by then." But, he says, there are some facets of the new world that he looks forward to: "As a tech-toy lover," Romenesko says, "I'm hoping there will be a Minority Report-like flexible, constantly updated LCD-style newspaper." Maybe, he says, by 2015. The priceless question is: What will be the quality, and reliability, of the journalism that Romenesko will be receiving on his newfangled gadget? Linton Weeks was an editor and reporter at The Washington Post for 19 years until he took a buyout in the summer of 2008 and joined NPR.